Cake.... I can honestly say I don’t like cake. When I was a kid, and it was birthday time, I enjoyed cake and ice cream, but I always mixed the melted ice cream with the cake, pushing the greasy fake colored frosting to the side. Actually, I ate the cake and ice cream mixture, for the ice cream. I do now and have always loved ice cream….actually any kind, yogurt, fat free, low fat, full fat, doesn’t matter, if it’s frozen and dairy or non-dairy product, I’m on it. That being said, this post is actually about cake. My opinion is that if you’re going to consume the calories, by all means whatever you do, don’t waste it on plain white or chocolate. Over the years the cakes that stand out to me, are a few I make, like Coconut cake or Sweet and Salty Chocolate cake or (Craig’s) Red Velvet. Now I have another to add to the mix, Bohemian Banana Cake. A few months back, my niece, who was graduating, turning 18, and had just been voted by her peers to be the representative from her high school (and my Alma-Ata as well) to be their Portland Rose Festival Princess, asked me to make the cake for her party. When we talked about what I would make, I told her about the cakes I had made in the past. She said whatever works for you. I told her, that’s not the way it works, that she had to choose. And she chose Banana Cake. Now, I have never made banana cake, so I had no recipe for a cake like this, but I have a few fond memories of an incredible Banana Cake . When I was working in Portland back in the late 90’s, there was a grocery store called Kienows. They had a bakery in store, The Bohemian Bakery. They specialized in delicious pastries, Black Forest cake, as well as a plethora of other delicious treats. But as we all said, “you know you’re loved if you get a Bohemian Banana Cake”. This was a soft banana cake, with Bavarian crème filling and fresh sliced bananas, covered with whipped cream and sliced almonds. Too-Die-For! So after some research, and google searching I found an incredible recipe, I just have to share. So, because Cassie is so loved, I made this incredible cake, and let me tell you, it was so good. I’m not sure there was a piece left at the end of the party. Remember, I am a baker, not a decorator! Preheat oven to 325 degrees. Grease and flour two 9-inch round cake pans. To make cake: In a large bowl, sift together sifted cake flour, sugar, baking powder, baking soda, salt. Add oil, mashed bananas and both kinds of vanilla. Beat 1 minute with electric mixer. Add buttermilk and egg yolks and beat another minute. Pour into prepared pans. Bake until toothpick inserted in center comes out clean, about 30 minutes. Cool on cake racks. Split each layer horizontally to make a total of four layers. Place 1 split layer on a plate, cut side down (the bottom, browner side up, is easier to frost than the cut side). Place wax paper strips under the edge of the cake so the plate will stay neat. Using a round-tipped steel spatula, spread with a layer of filling; Top with sliced bananas. Top with second cake layer (the baked, brown top facing up). Frost second layer. Frost sides with remaining frosting. Remove wax paper strips. Refrigerate until serving. Note about vanilla: Using a combination of real and artificial vanilla gives a better texture. Note about cake crumbs: The Bohemian Bakery apparently used dried, ground cake crumbs -- not necessarily banana cake -- pressed onto the outside of the frosted layers. You can skip this step or you could buy a couple of muffins, toast broken-up pieces in a toaster oven and process them to crumbs in a food processor. INSTRUCTIONS: Preparing the gelatin: Sprinkle the gelatin over the cold water; stir to blend. Set aside to soften for 5 minutes. (It won't hurt to let it sit longer.) Mixing the ingredients: Put the yolks in a bowl and, using a whisk or fork, stir briskly to blend. Slowly add the sugar and continue to stir until well mixed. Cooking the custard: Pour the milk into a saucepan and place over medium-high heat. Stand right by the stove and watch for tiny milk bubbles to form around the edge of the pan. The milk should be hot, but not boiling. It is better to underheat than to boil. As long as the milk is hot it will work fine. Pour the yolk/sugar mixture into the hot milk, then add the softened gelatin and stir with a large spoon or whisk to blend well. Cook, stirring slowly, but constantly for 3 or 4 minutes. Tilt the pan until you can see the bottom. If there is a thin coat of custard on the bottom that doesn't flow as readily as the rest, it's ready. Do not let the custard boil; it will be fine if you remove it too soon rather that too late. Pour the custard into a bowl and refrigerate for 30 minutes, or just long enough for it to begin to gel. It should be thick but pourable. This last step is the secret of a fabulous Bavarian Cream: Beat the cream only until it holds soft peaks. If the cream is too stiff, the dessert will be too firm. Fold the whipped cream into the custard. Spoon into a 2-quart mold or bowl, cover with plastic wrap or a lid and refrigerate several hours, to allow the dessert to gel. 1. Lightly whisk egg whites and sugar together over simmering water until egg-white mixture is hot to touch or a candy thermometer reads 140°F. 3. On your mixer, remove the whip and attach the paddle. Add half the butter (1 ½ lbs) into the bowl immediately and pulsate the mixer several times until the meringue has covered the butter completely. To pulsate the mixer, turn it on and off in a jerky motion. This forces the butter on the top to the bottom of the bowl. Add the balance of the butter (1 ½ lbs) and pulsate mixer several times. Slowly increase the mixer's speed, starting with the lowest speed and increase the speed every 10 seconds until you reach a MEDIUM-HIGH speed. I’ve been craving taco’s lately…hard shell, soft shell, street vendor style…..whatever, taco’s are quite simply the perfect food. So when I saw these recipes for Margarita Fish Tacos, and Jackfruit Carnitas, I had to quickly wipe up to drool. They sounded so good, I had to move them up a night on the Menu. Tonight I made both versions, cause I couldn’t decide on which one I liked better. (side note, they were so good, and went so fast, I forgot to take pictures!! I will remake them and take pictures of them at that time. Here are the recipes for them both. Try one, or the other, or both…enjoy! Also, I found a GREAT tortilla to use. It is a mixed tortilla tastes like corn, but feels like a flour tortilla. Combine mayonnaise, cilantro, juice, and chipotle. Warm tortillas according to package directions. Divide fish evenly among tortillas; top each tortilla with 1/4 cup arugula and about 2 teaspoons mayonnaise mixture. Fold in half. Onion, cut in to large pieces. Drain & rinse the jackfruit thoroughly. With your hands, press the moisture out of each piece & set aside. Place oil a deep pan on the stove and heat on high to sear the jackfruit, Mix spices in a small bowl, take your spices & season each piece of jackfruit, add it to a hot deep pan. Squeeze lime juice over the top of everything (I use a 1/2 lime per can of jackfruit), Cover and simmer for about 30 minutes, and use a wooden spoon to “shred” up the jackfruit. After the jackfruit is cooked, it will have changed colors & be a nice browned color. Serve the jackfruit in corn tortillas with some additional salsa on top & a squeeze of lime juice or any other toppings you enjoy! As described from wikipedia: The peanut butter and jelly sandwich (PB&J or peanut butter and jam sandwich in Australia, Canada and the United Kingdom) is a sandwich, popular in North America, that includes a layer of peanut butter and either jam or jelly on bread, commonly between two slices, but sometimes eaten open-faced. For almost all of us this was a staple in our lives, growing up. For my family, is was ONLY crunchy Skippy and mom's homemade freezer jam (usually raspberry, but I grew up in Oregon, so we had strawberry, blackberry, marionberry, boisenberry, just to name a few). Now there are many variations on the classic, crunchy, creamy, organic, all natural, freshly ground, almond, and the list goes on. And that's just the peanut butter! As for jam (I prefer jam to jelly!!) you name it. I work in a grocery store and we have a 4 foot section dedicated to preserves. Local, imported, regular, no sugar added, pure cane sugar, it'd make your head spin. 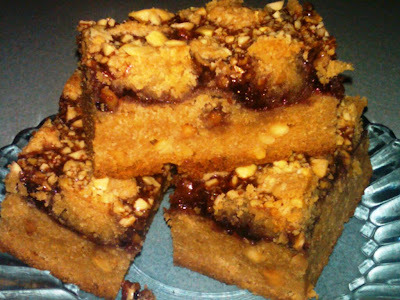 So for me, crunchy with blackberry jam is my fav! Whether it was for lunch, afternoon snack or even breakfast, I'm sure it's pretty near and dear to your heart. Few people I've talked to dislike the PB&J! So when I came across the recipe for Peanutbutter and Jelly Bars, I just knew I had to make them. After making the recipe, I've made a few adjustments that I know is just what this recipe needs to go from wow, to amazing! Grease a 9 by 13 by 2-inch cake pan. Spread. slightly more than 1/2 of the dough into the prepared cake pan and spread over the bottom with a knife or offset spatula. Spread the jam evenly over the dough. Drop small globs of the remaining dough evenly over the jam. Don’t worry if all the jam isn’t covered; it will spread in the oven. Sprinkle with chopped peanuts and bake for 45 minutes, until golden brown. Cool and cut into squares. Serve up with a big glass of ice cold milk. When I was growing up (notice I didn't say when I was little! ), my moms side of the family would go to the beach for a week each summer. These were great times spending the week with my grandparents, aunts, mom, sister and cousins. To this day my family still refers back to...."the time my cousin Lori had a fork thrown in the eye" or "the time we were allowed to go into the ocean by ourselves (without the Moms), and were almost killed" or "the day my cousin Christy and I found Black Licorice ice cream". Those times were great and the memories I will never forget. One memory the remain near and dear to my heart, is when my mom would buy Fig Newtons, while we were on vacation and would only share them with me (now granted, I'm sure that no one else liked them, but when your 8 that does matter). Ever since Fig Newtons have been my favorite cookie. When ever I have a Fig Newton, I have a fond thought of my mom. While surfing the Internet a few weeks ago, I came across a recipe for Homemade Fig Newtons and have been jonesing to make them ever since. Yesterday was the day. A few things I changed in the recipe are, I had previously made Fig Jam, so I used the jar I had left, and took the figs called for in the recipe, chopped them up and simmered them for about 15 minutes. I placed the dough in the bottom of the pan, spread the fig jam over the dough, then sprinkled the drained chopped figs over the spread. Then placed the top dough and baked. 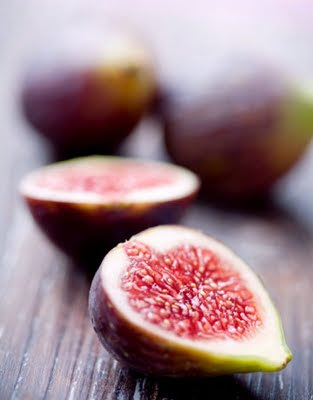 Dice figs, soak in water 1 hour. Add sugar & cook on medium heat until of thin jam consistency. Beat sugar, butter, egg, milk & vanilla until well blended. Mix well and refrigerate for 1 hour. Place 1/2 on well floured dough cloth; knead about 6 times. Roll out to 1/4" thick. Line 13 x 9" glass baking dish; cover with figs. Roll remaining dough, cover figs. Cook at 350° for 30 minutes. Depending on the size you cut you can get a couple dozen cookies. 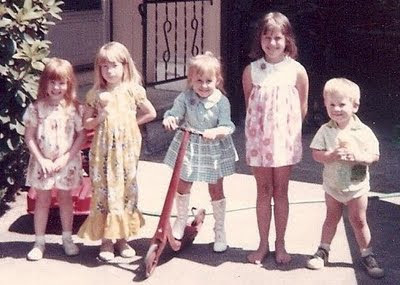 The Cousins: Christy, Carrie, Sheryl, Lori and Me....I think my legs have straightened out by now.